Set aside 1/4 cup frosting. Frost cupcakes with remaining frosting. Sprinkle frosting with sugar crystals. 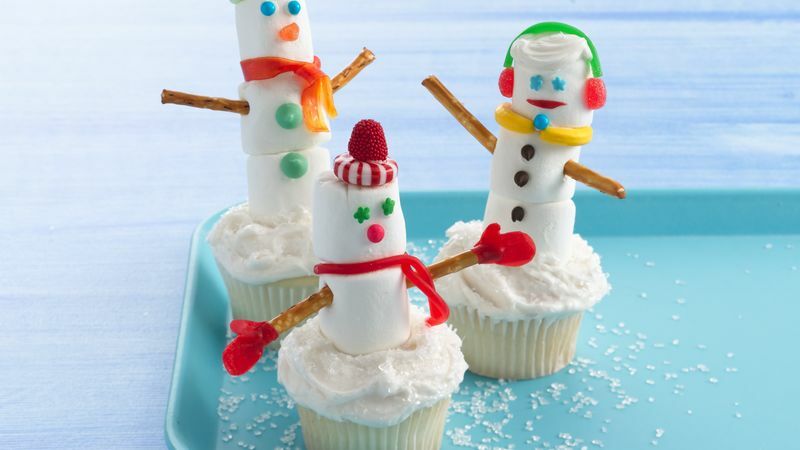 Stack 2 or 3 marshmallows on each cupcake, using 1/2 teaspoon frosting between marshmallows to attach. For arms, break pretzel sticks into pieces 1 1/2 inches long. Press 2 pieces into marshmallow on each cupcake. Cut 1-inch mitten shapes from fruit snack. Attach mittens to pretzels. For scarf, cut fruit snack into 6x1/4-inch piece; wrap and tie around base of top marshmallow. For hat, stack candies, using frosting to attach. For earmuff, use piece of string licorice and candies, using frosting to attach. For faces and buttons, attach desired candies with small amount of frosting. Store loosely covered.